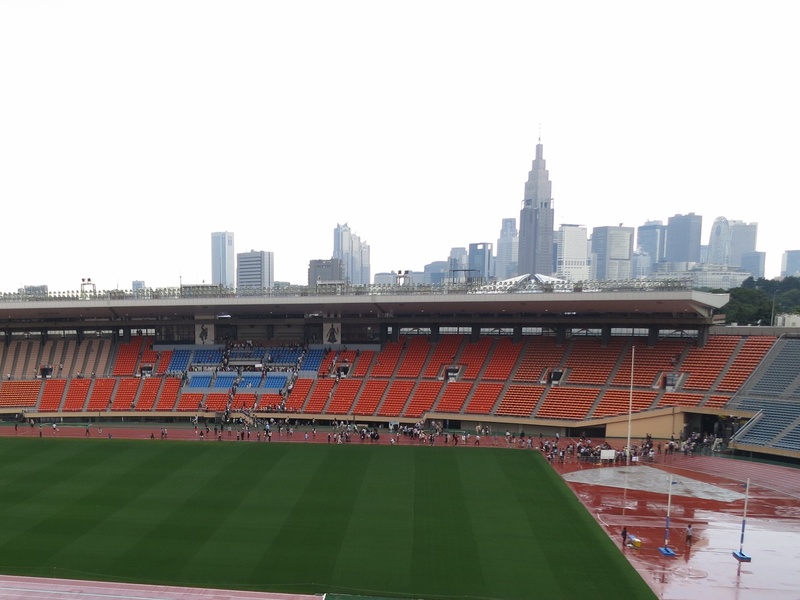 Tokyo, April 16 – The match between FC Tokyo and Kawasaki Frontale was set to be a mouth-watering matchup between the Japanese national team’s first choice center back pairing of Morishige and Maruyama against a free-flowing attacking side led by the league’s record scorer Yoshito Okubo. Okubo had rewritten the history books by overtaking Gon Nakayama’s record haul of 158 goals in the Japanese league and seemed ready to oblige with some more. 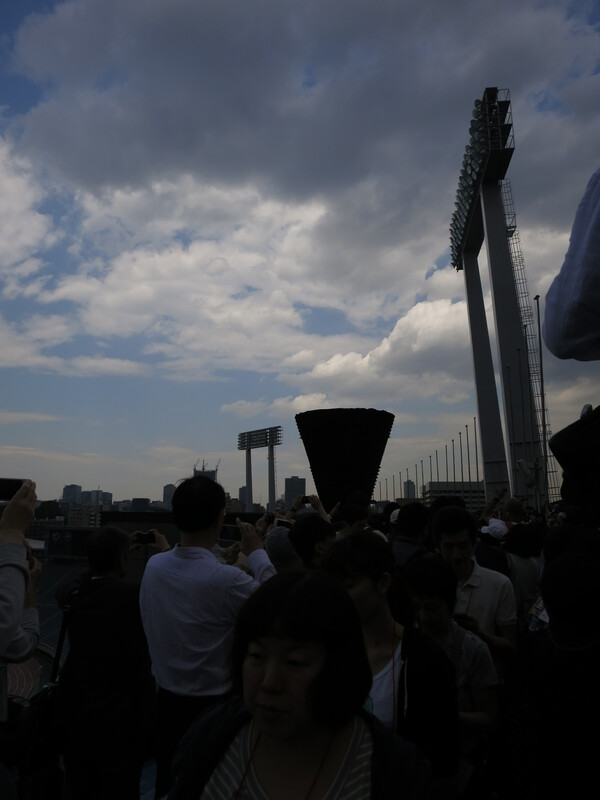 The atmosphere was electric with almost 30,000 cheering on their teams in the Tamagawa Classico, named after the river that flows alongside their fan bases. FC Tokyo was set up to counter with Nathan Burns to drive directly at and exploit the space behind a notoriously porous Kawasaki backline. The tactic paid off quickly. Sotan Tanabe capitalized on some unsettled defending, and the ball bounced nicely toward Burns who sped away and drove it in for an early Tokyo lead. The early goal sent the home supporters bouncing, but it didn’t last. Kawasaki struck seven minutes later, in the 11th minute, with two team stalwarts linking up. Kengo Nakamura directed a looping pass behind the Tokyo backline for Okubo to run onto. He shrugged off sideback Ogawa’s challenge, and blasted it in to take his tally to 160. However, Kawasaki were unable to find any fluidity in their game and their attacks were constantly repelled before they could really threaten the goal by a combination of solid defending and good midfield cover. The on-looking national coach would have been pleased to see the quality of play at both ends of the pitch. FC Tokyo were asking the questions. Burns had a hatful of chances to put FC Tokyo back ahead. He slid the ball wide from a carbon copy opening, and when Maeda teed him up in a central position in the penalty area, he ended up shooting wide. Kawasaki rode their luck when he headed a Ha Dae Sung cross just over, and the teams ended the half level. Kawasaki started the second half brightly, Okubo driving a long-range shot onto the crossbar. As the half wore on, World Cup final referee Nishmura exercised more control as tired legs made for more fouls and openings. FC Tokyo was let off the hook when Moritani seemed caught in two minds all alone after rounding the keeper. FC Tokyo then won a freekick near the Kawasaki penalty area. Ogawa drove in a dangerous low cross in behind the defensive line toward an onrushing Maeda who pounced from close range. 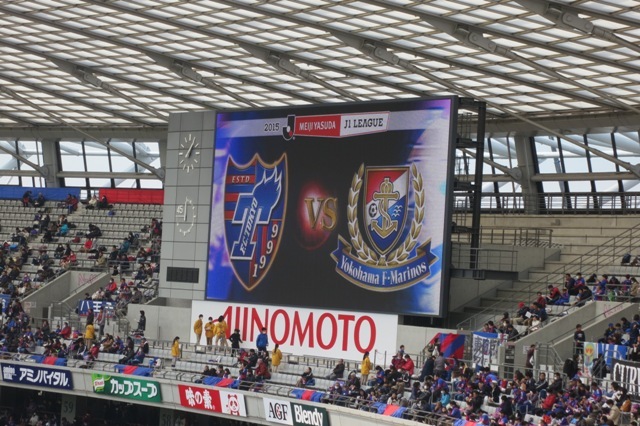 2-1, and FC Tokyo was ready to wrap up the game with half an hour to go. Burns linked up well with Maeda and Yonemoto but failed to create a 2-goal cushion. The crowd was instead treated to the guile of the master goalgetter. Okubo ran into the box and seemed ready to pull the trigger in front of a mass of bodies. But he faked a shot with his right foot, then as he repositioned the ball onto his left foot, he got caught by Yonemoto’s trailing leg. FC Tokyo fumed at the decision, but he had been caught in the box, and Nishimura chose to apply the rules to the letter. A soft award but a strong penalty driven gleefully down the center for no.161. The home fans were somewhat deflated but picked themselves up to sing “We can’t lose” in a bid to remind the players that the scores were still even. With 15 minutes to play, FC Tokyo coach Jofuku sent on Muriki for a tiring Maeda to bring some trickery to the frontline. The change did little to stem the newfound Kawasaki rhythm, and the waves of attacks soon found an opening. Elsinho threaded a pinpoint pass through to Yu Kobayashi just beyond Tokunaga, who could not stop him or his rocket into the top corner. Kawasaki had fought back to lead 3-2. Muriki could have tied the game, but his rushed shot went just wide. Tension crept into Tokyo’s game and it made them dally on good positions so half-openings slipped away. Kawasaki were not done. Right to the end, they showed greater verve and made possession count. Kengo Nakamura raced down the flank and cut into the box and down the byline before finding Elsinho unmarked at the far post, who made no mistake. Record scorer Okubo lay on the ground at the final whistle and he ended up leaving the pitch on a stretcher, but FC Tokyo will have rued missed chances and a penalty that changed the complexion of the game. 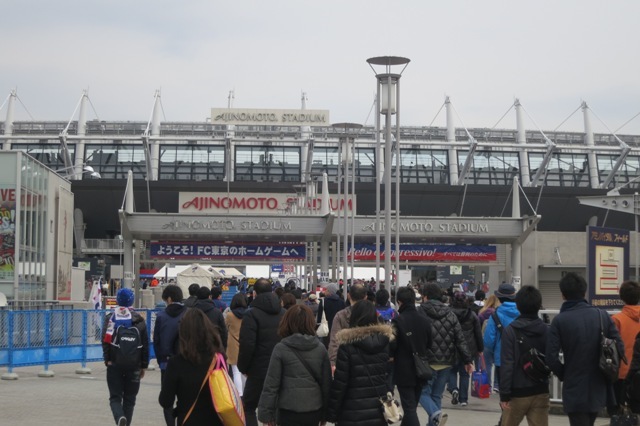 Tokyo, February 27 – Anticipation and excitement filled the air as more than 25,000 fans packed the Ajinomoto Stadium for FC Tokyo’s league opener against Omiya Ardija. Before this game, Tokyo already played 2 competitive games in the Asian Champions League, putting nine past Thai outfit Chonburi FC without reply at home in a qualifier and losing in Korea at Jeonbuk Hyundai in the first group game. The bread and butter business started today. Or rather should have started with a reassured performance against a dangerous, but nonetheless unfancied side. Pop group rip slyme warmed up the crowd with two psychedelic dance beats. Tokyo started in tune, fashioning several half-chances with some slick passing involving new boy Takuma Abe. However, as the game went on, Tokyo’s possession became increasingly laboured. In midfield, Kajiyama and Mizunuma struggled with the height and strength of Pecnik and Mrdja, the central defensive partnership of Morishege and Maruyama threatened mix ups from time to time, and Abe’s diagonal runs in attack failed to draw enough timely balls in behind the Omiya backline. Omiya held firm to keep the scores level at half-time. The second half continued in the same vein. Tokyo probed and passed, looking for openings slowly across a wall that became more solid and organized as the game went on, which eroded the confidence of the home side. In contrast, Omiya were compact, always seemed to win the second ball, and had players who seemed to know where one another were. The tone of play switched, when it did, quickly from unsure and jaded to organized and speedy. Omiya’s 69th minute goal came against the run of play that began with Wada’s looped pass to Mrdja over newly-introduced Shoya Nakajima. Mrdja shook off and outpaced Maruyama on the wing before putting in a fast cross that found Ienaga who had adjusted his run to create a gaping hole ahead of a Tokyo back line that had retreated too deep. His shot was blocked by Hashimoto but fell to an onrushing Iwakami who gave Akimoto no chance in goal. The space around the penalty spot highlighted the mistakes on display. Morishige had been wrongfooted, Kajiyama was too distant. Credit to Tokyo for pressing for the equalizer in the next 15 minutes or so even though faces were visibly sullen and shoulders had drooped. Nakajima was instrumental during this period, spraying passes behind the Omiya backline. As the clock ran down, Tokyo even managed to hit the bar. But they were visibly anxious to keep the ball and find that elusive pass. Home fans fumed at indecision to play the ball forward until the spaces on the field disappeared quickly into the stands, eventually condemning the team to an opening day loss and boos from the home end. Film review, February 21, Tokyo – Bring a football team from the nation’s capital and a movie production team of club fans together and you get a documentary. Simple? Not really. “Baile Tokyo – Weaving the History” was shot over the 2015 J-League season to tell the story of the ups and downs of a year that promised so much but delivered too little. Followers will remember the early euphoria from sitting joint top with Urawa in the early part of the 2-stage format competition, the mixed farewell to striker Yoshinori Muto’s mid-season departure to Mainz, and the despair of the scoreless draw with Sagan Tosu on the last day of the season that left them short of a chance at the league’s top prize. 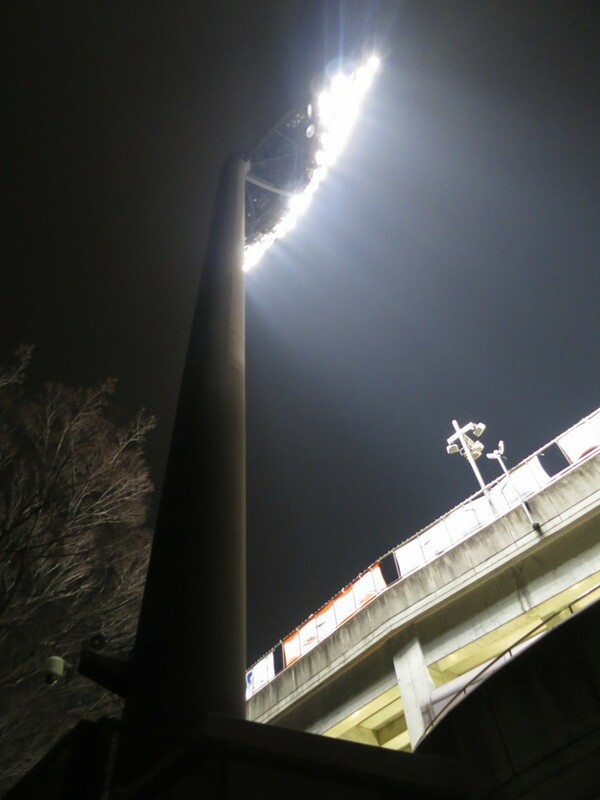 Dedicated fans would also recall the season-ending away loss to Hiroshima in the Emperor’s cup semi-final. Yusuke Sakakibara’s first full-length documentary speaks to fans and wannabes, drawing on the mutual affection amongst the players and with their fans. Mixing stock footage with press statements, casual conversations in relaxed settings, and the occasional training session, the to-and-fro disrupted attempts to create a coherent message but combined well to tell the story behind an up-and-down season. Documentaries normally focus on characters or themes to build stories around them. Sakakibara chose to shine the spotlight on a select group of several persons in and around the team. Players, officials, supporters were covered along with the club physio, in a sub-narrative of a battle for fitness after injury, a topic that is often said but not necessarily properly portrayed as part and parcel of sport. 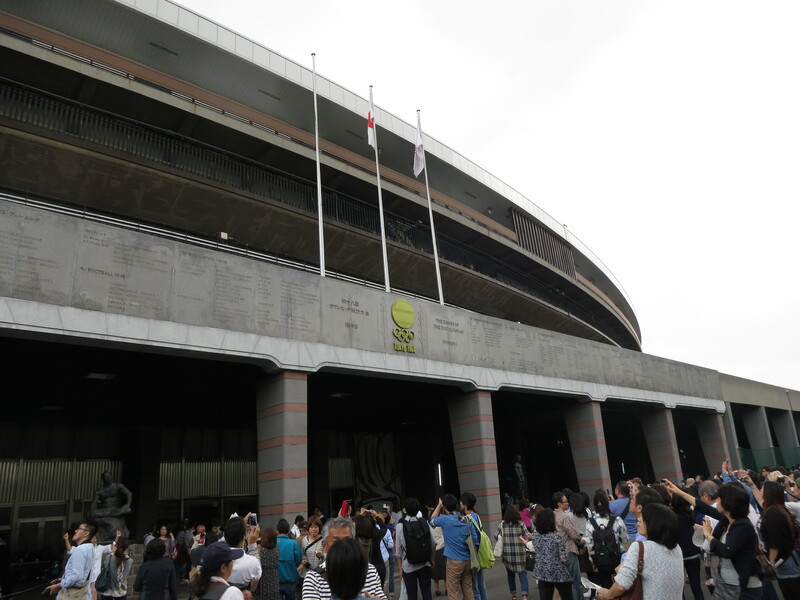 Officials were roped in to clarify the club’s ambitions – bring Tokyo to the top of Japanese and Asian soccer – even though they admit that the team hasn’t won the domestic title. On the business side of things, it tried to scratch the surface of fanbase growth and media coverage. Japan’s capital has a broad, vibrant population that has the potential to bring in massive turnstile receipts. 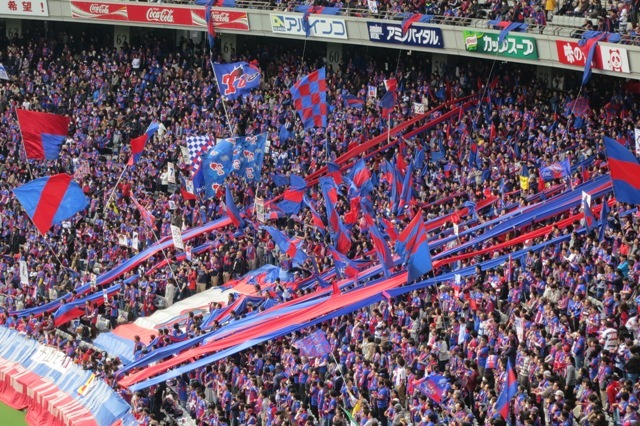 Indeed, FC Tokyo boasts an attendance of 28,000 per home game, second only to the fanatical Urawa Reds support, but this intake hardly fills even three quarters of its 50,000-seater Ajinomoto Stadium. Half-hearted media coverage and mediocre performances had promised to change with the prolific Muto, but he left midway, as the film reminds us. Football fans often rankle and fume about how their team lost, was unjustly penalized, and feel joy at a lucky escape and pride at a well-earned win. Involvement is emotionally charged, whether in the stadium or off it. The documentary did well to paint sentimental farewells to fond faces, most notably Muto and Kosuke Ota. The emotional roller coaster ride is probably its best part, so fans have been warned – bring your tissues. Overall, the film echoed the club’s ride in 2015, opening with promise and trying to end on a positive, forward-looking message, by mentioning its new B team’s participation in J3, Japan’s third tier. So it was half-expected to run out of time, or steam like the team did in 2015, and viewers are left with the choice of leaving their memories of 2015 at the cinema or continue writing the next chapter of FC Tokyo’s history together with the club in the new J1 season, starting on February 27. “Baile Tokyo – Weaving the History” is directed by Yusuke Sakakibara. Opened on 20 February (Sat.) at 19 theaters across Japan, including Toho cineplexes in Fuchu, Odaiba, Shibuya, Shinjuku, and Yokohama. Fuchu Toho cinemas opened for prescreening on 13 February and is giving out 3 special edition movie postcards per viewer while stocks last. 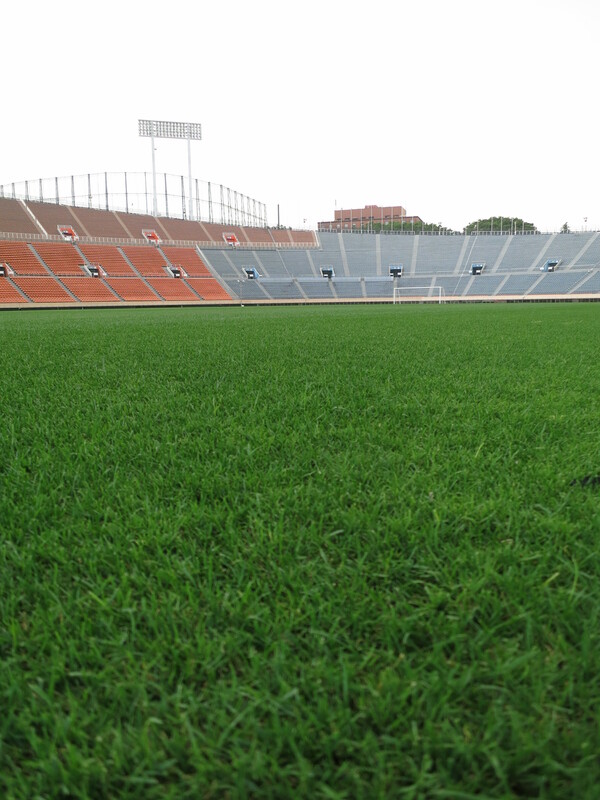 Tokyo, 5 June – The Japanese Women’s national football team are enjoying a golden era. Sitting pretty atop the world since 2011, they went on to narrowly miss out on the 2012 London Olympics gold, but bounced back to win the last edition of the Asian prize in 2014. Nicknamed Nadeshiko Japan, the former a Japanese variety of the carnation and a synonym for reserved resilience in Japanese women, the team have had a few wobbles in their run-up to the 2015 Women’s World Cup starting tomorrow. Off the pitch, preparations to consolidate themselves at the top of the game have already gained ground in Japan. Pulling it out of the pile, straightaway the words on the cover struck me – for girls and boys alike! The order was clear, the target pretty high. Doraemon fans would be quick to realize that Shizuka has some innate sporting ability (when she did a body swap with Nobita and played a blinder in a baseball game), but the book goes beyond that by bringing in a new girl classmate. And guess what, that girl is an expert in football. The book brings the usual suspects through a journey of learning the basics, from passing, heading, trapping and dribbling littered with rather blunt jokes by the willing cast. Besides the story, the book doubles, or rather it’s primary purpose is, as a quick intro to the rules of the game. It goes further, describing mini-games and drills to do with friends or alone. Moving through awareness of team mates and passing to tackling dribbling in the latter pages, the editors obviously recognize the difficulty and skill involved to maintain reader interest as she/he developed. A Shizuka-chan mini-series runs inside too, where she goes through some exercises to familiarize with the ball. The target can’t be any more clearer, and as a parent that would gladly take his children to a game, the idea certainly sold very quickly. In my everyday routine, I’ve noticed many children’s football teams in Japan, and all-girl teams are not uncommon. The supervisors of this book, the Japan Football Association, obviously recognizes that for girls to develop their game, they have to play with their friends, and that often means playing among the boys, as did Homare Sawa, Japan’s most capped women’s player. She’s no longer the captain, but still a highly influential figure on and off the pitch. The Japanese team is simply a joy to watch. They pass, link up and use the occasional dribble and feint to create and find space for team mates to capitalize. Not the most physical team around, their work and organization as a team are excellent. However, their recent string of successes seems to created some pressure, but the media have been very supportive, unlike their often scathing coverage of the men’s team. With such warm support and a book like this to help unearth and nurture new generations, I sure hope we get to enjoy this brand of football at the highest level in years to come! 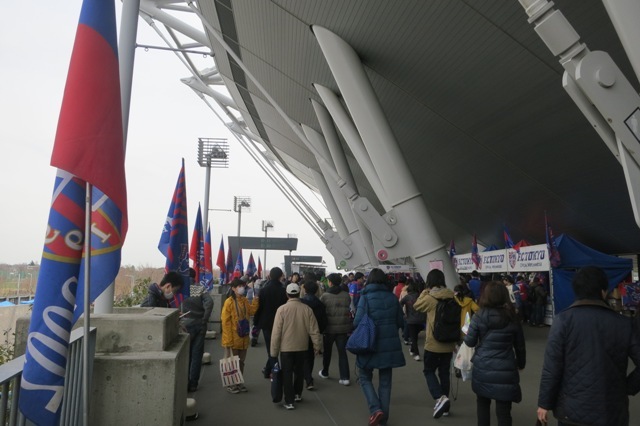 Chofu, Tokyo – FC Tokyo’s opening home game for the new season pitched them against the same team as last season’s final game. Just over 3 months since the 1-1 draw at Ajinomoto stadium, Yokohama Marinos were looking for their first points of the new campaign. Meanwhile, FC Tokyo had clawed back a point from last season’s treble winners, Gamba Osaka, when its suave young striker Yoshinori Muto completed his brace deep into stoppage time to send the travelling fans into ecstasy. 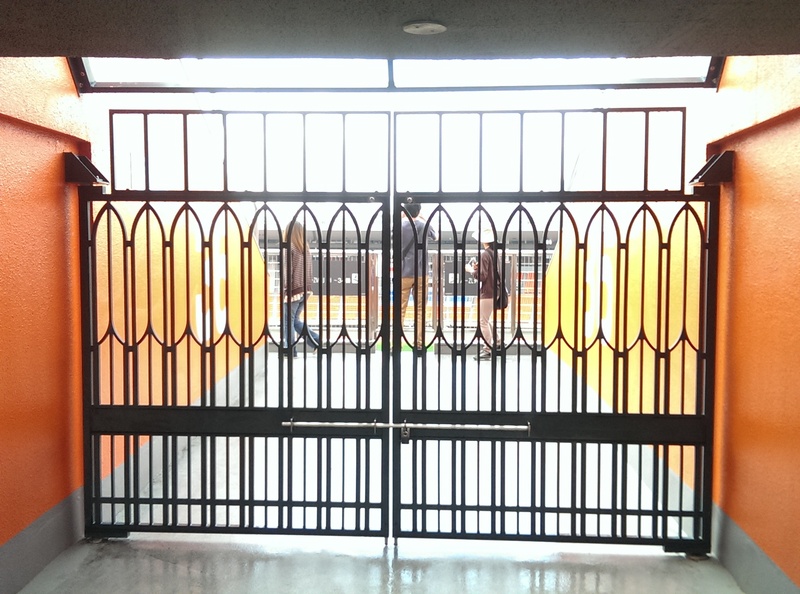 Tobitakyu station was filled with an expectant home crowd and similarly excited away fans. The away team clearly saw themselves as tricolour, while Tokyo was largely blue tinged with wine red. With both teams sporting similar team colours, the two sets of fans and their gear could only be discerned at close range as they made the mandatory 5-minute trek from the station. 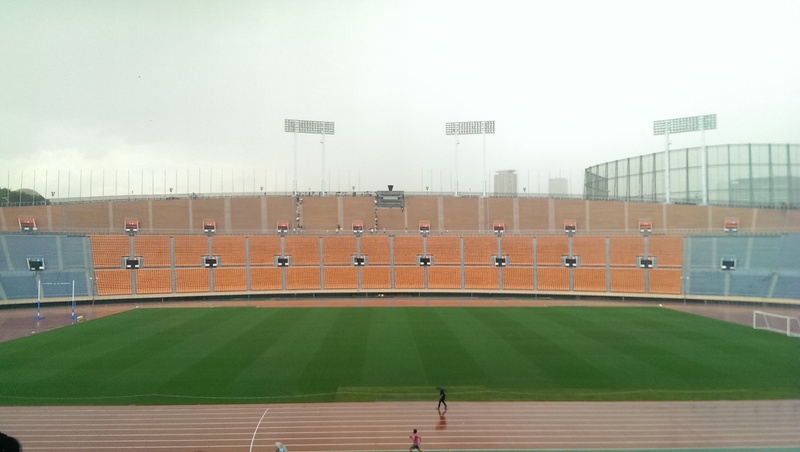 Of course, they also parted ways to move to opposite sides of the stadium. Incidentally, the away team were to sport their new gold away kit for this fixture. Opening home day fanfare lined up special guest, singer and actress Sakurako Ohara to rock the stands before kickoff and the Tokyo Girls Collection’s official Tokyo Girls Run team of runway runners on the pitch at half-time. A group was spotted sitting pitch-side throughout the game. These fans were owners of new special one-day tickets and accompanying authentic design collapsible chairs provided by kit sponsors Umbro. Open only to home supporters and coming with strict viewing conditions, excitement seemed to bubble from that part of the pitch, which was as close to the home goal as you could get. The stadium concourse was packed with lines of hungry fans eager to grab a bite before the 2pm kickoff. Dorompa, Tokyo’s sporty raccoon dog mascot, could be seen everywhere, but the real one had its usual busy schedule of appearances in various locations. A Tokyo-only menu item taco-rice (rice topped with taco filling) had sold out early. Whether this had anything to do with taco meaning to draw a blank in Japanese, home fans were definitely hoping to see goals to build on last weekend’s result. The game was also to be a surprise first to be watched by Vahid Halilhodzic shortly after his official announcement as the new coach of the Japanese national team. The Bosnian had famously led Algeria to the last 16 round for the first time at the 2014 World Cup. After the usual team announcements, the stadium aired a familiar tune – You’ll Never Walk Alone. The rendition of one of football’s most famous anthems by a largely Japanese home crowd, where the music tapers off midway, left a sombre and dignified tune filling the space between the two sets of fans – welcome to Tokyo and let the game begin. The 30,000-strong crowd was slightly short of attendance at last season’s closer, nearly 32,600. Both sets of fans were left hanging on until the closing stages of the game in a solid tactical performance by both teams. Tokyo came nearest to goal twice in the first half while Yokohama were also culpable for failing to finish off clear chances. It was only late in the game that Tokyo seemed to change gears, as the visitors endured waves of attacks that just lacked the final pass. A sense of deflation seemed to linger after referee Yuichi Nishimura (yes, he who attracted worldwide attention in Brazil’s opening World Cup 2014 game against Croatia) blew the final whistle, and fans were left to reflect on lost chances and the dejavu of another draw from the same fixture. 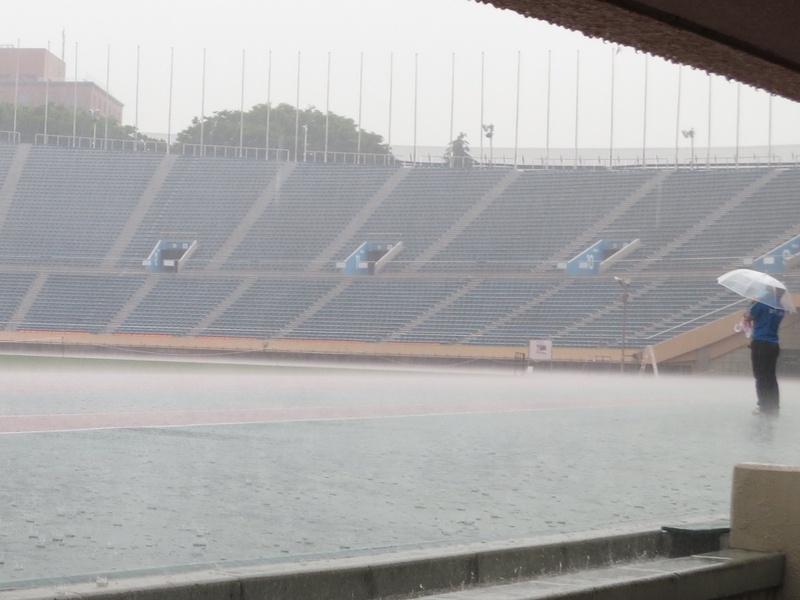 Hiratsuka, Japan – With the day’s opening 2pm kickoffs out of the way, I ventured to the Shonan BMW stadium in Hiratsuka in search of the opening day revelry. As the sun set, I made my journey toward Isehara station, about an hour West of Shinjuku on the Odakyu line, for Shonan Bellmare’s J1 game against perennial title favorites Urawa Reds. New entrants Bellmare had comfortably topped J2, the league’s 2nd tier, entertaining everyone with a brand of speedy, all-out attacking football last season, but they knew that the top tier required an overall balance in their play. Pre-sale tickets for the match ran out within two days, a rarity for opening day, but this was definitely compounded by hope for the home team, the stadium’s relatively low 18,500 capacity, and fanatical away supporters more accustomed to the comforts of a 63,700-seater home in Saitama. Urawa, together with J-league flagbearers Gamba Osaka and Kashima Antlers in the Asia Champions League, had already suffered consecutive losses in a stuttering start to the new season. In particular, they had been on the wrong end of a combined total of 6 losses, an overall zero return, a fact that did not escape J-league Chairman Mitsuru Murai’s attention. The stage was set to begin anew on the opening day to recover some loss pride, light up the domestic scene and showcase the talent available in the league. 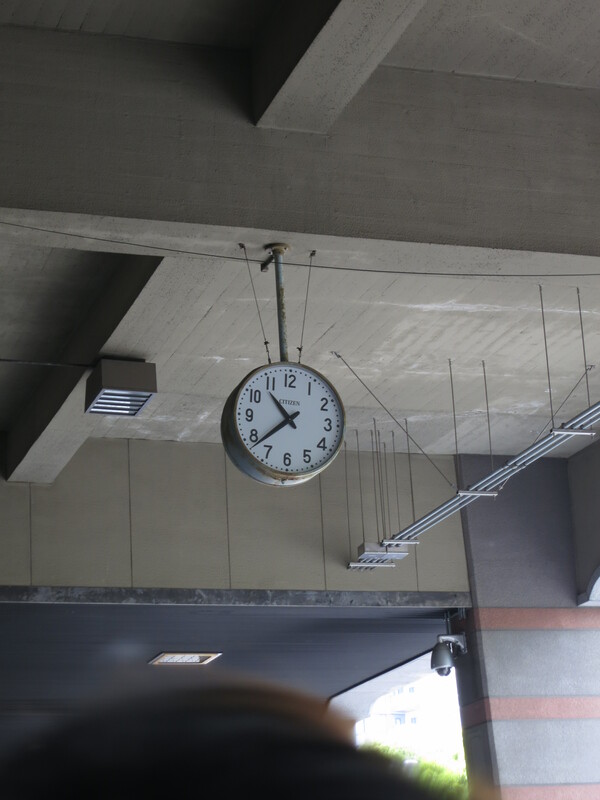 Outside Isehara station, there was calm punctuated by the occasional shuffle. Nothing seemed to be happening anytime soon, save a signboard that told people heading to the stadium to form a separate queue from those for regular services. Two shuttle bus services were running, one at each hour before kickoff. Making the second one with about 30 minutes to spare, a handful of about 10 people waited silently in line. The sky was turning dark as the single ground staff hollered instructions through a toned down loudspeaker. 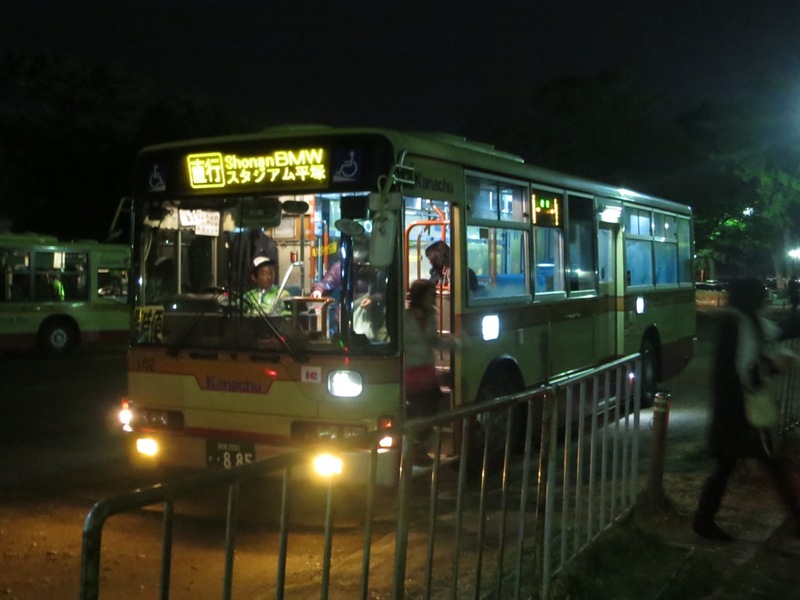 A bus sitting quietly in the corner waited its turn with a signboard showing “Shonan BMW Stadium Hiratsuka”. As I stood in line, a few others followed to extend the line by 3. The bus eventually came round with no one else joining us. 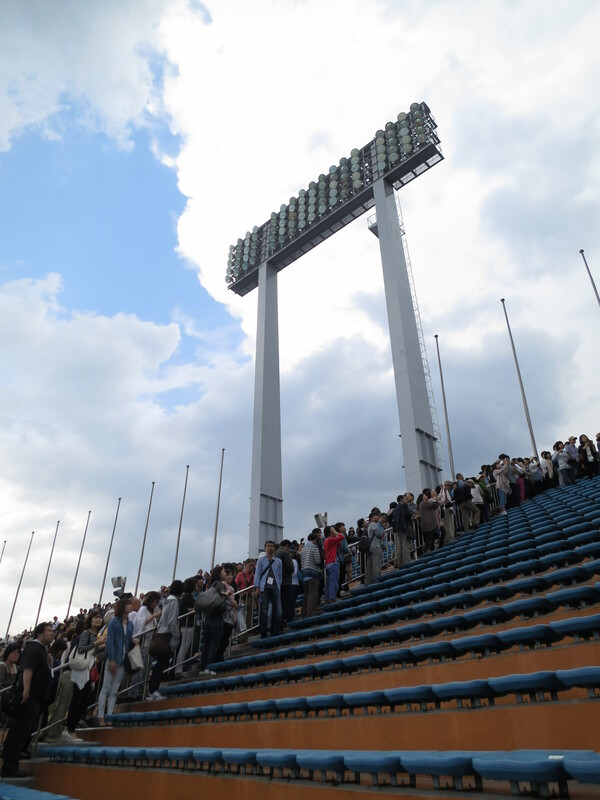 I was wondering about the first shuttle service when it dawned upon me that the larger part of the crowd would probably have used the JR Hiratsuka station, which was 25-min away from the stadium on foot. In contrast, this was a 25-minute long drive through what seemed like the deep countryside. Reaching our destination, fans streamed toward the stadium. They led me through a park and past the dark daytime establishments. 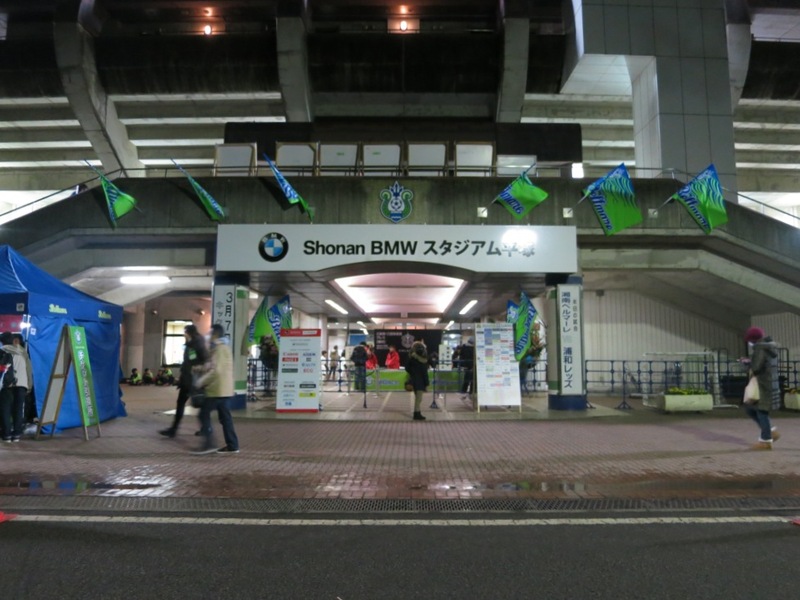 Match day stalls lined the other side of the street facing a row of fluttering Bellmare flags. Ecstatic girls took photos with flags of players that tickled and teased in the mild breeze. Fans rushed ahead while talking on their mobile phones. Speakers blasted dance party music but it quickly dissipated into the vast silence. Just past the row of stalls was the stadium arc. I took a quick stroll round it to assess the view. An open bowl with openings at the corners, the perimeter fences allowed ticketless fans like myself to peer inside to catch the game. The Urawa end was particularly open with the goal in plain view. The atmosphere in the cauldron leaked out, but even the incessant chanting by the 18,000 strong crowd did not reverberate beyond the stalls nearby. Sound proofing wasn’t needed. Situated in the middle of a park about 2.5 km inland, sound simply had nothing to bounce off of. A private party was underway, and two teams would do battle for a win to kickoff the new campaign. Flags waving, the player’s names over the PA were greeted with cheers from both sets of fans. 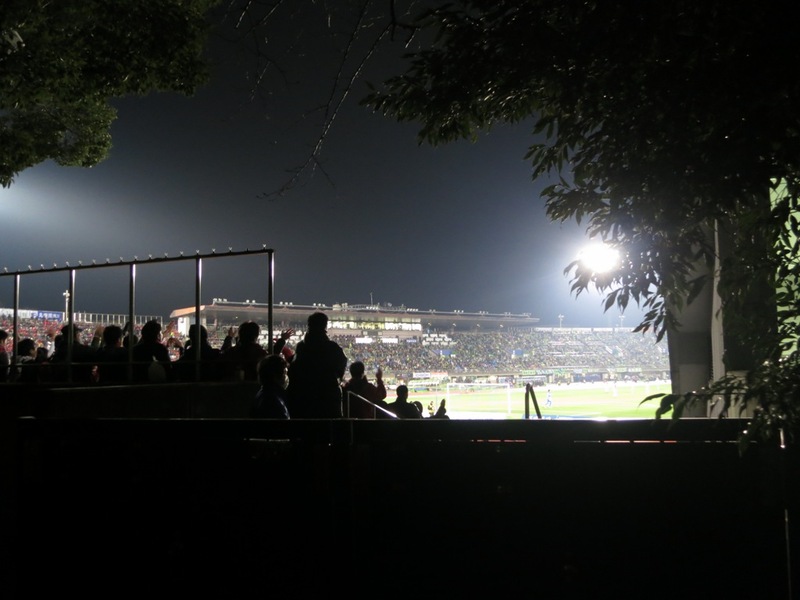 The stage was set, and the ticketless few had taken up posts along the stadium’s perimeters. It was a queer sight, faces peering in that were lit up by the floodlights that shone onto the pitch. They could have easily been mistaken as searchlights, for the surrounding woods were almost pitch black, and it left me feeling twice detached as a neutral watching from the outside. As the game kicked off, I made my way back to the station on the regular service, grabbing a bite from one of the stalls on my way out. As expected, the return trip took longer than the direct shuttle service, and I was the lone passenger for a large part of the journey. The whole experience left me feeling excited, but also wondering how lower division J2 and J3 teams managed to maintain afloat and still remain competitive. That would call for some deeper research into the league’s finances, but the support in the stands is very much alive and well. On the pitch, with 22 strikes in the 7 lunchtime kickoffs and no bore draws, its goals galore on opening day, and the new 2015 season has truly taken off.